Miracle A/S is a small company in Denmark, which every year among other events organizes a three day conference about Oracle database and is traditionally held in October. This event is now called "Miracle Open World" and is traditionally organized at Lalandia, near Rødby on Lolland island, Denmark. This year it was the second time I was attending this great event and decided, of course, to fly there. The event started at Wednesday, October 22nd 2008 and ended on Friday, October 24th in the evening. Because the weather at the end of October can be already pretty unstable I decided to depart to Denmark between the Saturday 18th and Tuesday 21st - on a day that the weather would be good enough to fly there without being forced to make some stops due to bad weather. About 14 days before my departure I started to monitor the long term forecasts. They we changing a lot during fist 8 to 10 days, but after that it became clear that the best day for traveling would be Sunday, October 19th. I had to look for good weather to cross the Slovenian and Austrian Alps and also to be able to land in Denmark where the weather is like in England. All fronts which pass Great Britain are continuing to the east and then hit Denmark and other Scandinavian countries. Therefore I had to find a gap between these fronts. For this journey the most critical was for sure the weather. The route planning showed that I will have to make a re-fueling stop and according to the prices of gasoline I decided to make a stop in Czech Republic where the price is about 1.20 EUR/liter. The best location would be in the area near Plzen so I decided to make a stop at Letkov airfield (LKPL) just few kilometers north-east of Plzen. Unfortunately the last evening I found that there will be most likely a fog next morning and therefore I found another airport more to the north - Žatec (LKZD). I called them by phone and asked them if I can do a refueling stop and if they usually have a fog in the morning. The answer was very encouraging, so I decided to change my route and land there. Next morning we (my wife and me) were in Divača before the sunrise and topped the airplane with the fule and we departed at 7:57 local time. The weather in Slovenia was excellent and also the weather forecast for Apls was good. Just before the departure I checked all web cams along the route and the weather appeared excellent. The route to Žatec was: LJDI (the new ICAO code for Divača) - LJAJ (Ajdovščina) - ISTRI (border point with Austria) - LOLU (Gmunden near Salzburg) - DOMAL (border point with Czech Republic) - LKZD (Žatec). After departure we climbed to 9500 feet before we crossed the Austrian border and after that to FL115 to cross the Austrian Alps and then back to 9500 feet. The weather in Czech Republic was excellent, no fog and also landing at Žatec airfield after 2 hours and 59 minutes of flying was without any problems. Žatec has a grass runway 1120 meters long which is also used for training flights with jet aircraft and is in perfect condition. The guy at the airport office offered us some excellent cakes and coffee. After that we topped the airplane with Natural 95. They are buying this gasoline on a nearby gas station just 2 minutes away. 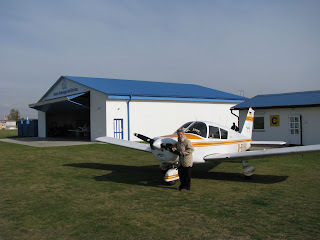 The fuel consumption to Žatec was 82 liters what is very good for a 3 hour flight across Alps. The next route towards Denmark was: LKZD(Žatec) - DRN (Dreseden VOR) - EDCP (Peenemünde). I wanted to visit the Peenemünde museum about the development of V-1 and V-2 rockets during the Second World War. Žatec is quite close to German border and after crossing it we were heading towards north to Peenemünde. The biggest airports in former East Germany are those in Berlin and they have pretty large TMA zones surrounding them. Therefore I asked for permission to overfly them at FL100 and got it. Already south of Berlin we encountered almost an overcast and also on the north side of Berlin the weather was the same. We were flying at 9500 feet and looking for a hole in the clouds to be able to go down and continue under clouds. Finally we found one big enough to go down safely. So I made a descending turn and entered that hole. Suddenly I found that my gyro-compass is turning around uncontrolled and also the artificial horizon is showing strange banking angle. A quick look the the vacuum pump gauge gave the answer - we lost the vacuum pump. There was another cloud layer down there so we had to find another hole to go down and continue flying towards Peenemünde. When we were below the clouds the visibility was quite poor and the clouds bases were at 1300-1500 feet so I had to make a decision what to do. We lost the vacuum pump and the weather was not very good and flying without attitude indicator and gyro-compass in such conditions wouldn't be very smart. So the best decision is to make a stop at the nearest airport. I pushed the "nearest" button on my GPS receiver and found that the closest airport EDBD (Dedelow Emmel Airfield) is only about few kilometers away. Therefore I contacted the ATC and notify them that we are landing due to bad weather and they gave me the frequency for EDBD airport. I called EDBD and immediately got the permission to land. Dedelow Emmel Airfield (EDBD) is private airfield owned by Frank and Petra Emmel. Frank is a former airliner pilot flying now smaller airplanes. He was captain on Boeing 737 . Petra was secretary and now they are both running this nice airfield. Frank is also certified to make minor repairs on private airplanes and he helped me to diagnose whether we really lost the vacuum pump. Because it was Sunday afternoon there was no possibility to call some maintenance shop and therefore we decided to stay at Dedelow during the night. Their hospitality was so great that they offered us to sleep in their house and Petra prepared excellent spaghetti for us. Unfortunately Frank had to leave for Frankfurt later on so in the evening we had a great chat only with Petra. She told us about their dream to run their own airport and showed us also the album about their trip to Spain, Portugal and Marocco more than 20 years ago when Frank had only 22 hours of flying after getting his private pilot license. They are now running this airport for 3 years. Next morning the weather was excellent and we called "Aircraft Maintenance" in Neubrandenburg which is only 15 minutes flying away and it turned out they had a spare vacuum pump. Petra prepared us and excellent breakfast and then we left this nice airfield. I must say that we were so surprised because they welcomed us in so nice and warm manner and were so kind and helpful in moments when we really needed the help. Therefore I must express my thankfulness once again also here that every reader will know how nice couple they are. The flight to Neubrandenburg( ETNU) turned into a short panorama flight because there were so many small lakes below us. Petra gave me a copy of the aerodrome map with the details for the VFR approach, so we had no problems to land there. We parked the airplane in front of the maintenance hangar and in few minutes Werner Ritter started to work on vacuum pump replacement. After 1.5 hours a new pump was installed and I made a short taxing on the apron to test the replaced pump and it was working perfect. Werner then gave us a lift to the nearest bankomat (ATM) to withdraw some money to pay the invoice. Also here in Neubrandeburg we found a very kind man, prepared to help immediately. While he was working he told me stories from his life in former Eastern Germany when he was maintaining Russian airplanes and helicopters. Finally we started the last leg of our journey to Denmark. The route was ETNU - EDCX - Gedesby (Denmark) - Køge (EKRK VFR reporting point) - EKRK (Copenhagen Roskilde). After takeoff I switched to Bremen info and afterwards to Copenhagen info after crossing the Danish border. The flight took us only 1 hour 20 minutes, the weather was sunny almost without clouds, however, a strong wind from south west was blowing so the runway in use at Roskilde airport was 21. While we were landing there we had about 20 knots of head wind. We parked the plane on the apron and secured it. Mogens Nørgaard, the technical manager of Miracle A/S came to the airport and gave us a ride to his home where we stayed for next two nights. During our stay at Mogens' house we visited Copengahen took the canal tour with a special kind of a boat. The only time I was in Copengahen was back in 1989 and at that time I found Copenhagen as one of the most beautiful cities in the world. On Wednesday morning, October 22nd 2008, we had to move to Lalandia on Lolland island. We took some gasoline at Copenhagen-Roskilde airport and payed the landing and parking fees. The landing fee was 10,78 EUR and parking fee per night was 7,82 EUR, the price of the avgas was 2,38 EUR per liter. Because I was expecting to fill the tanks with mogas at Maribo airport I took only 21 liters of avgas. The flight to EKMB was uneventful and we were flying at 3000 feet after clearing the Copenhagen TMA zones. We had only about 10 knots of cross wind when landing at EKMB. After landing I immediately payed the landing fees as I was expecting to fly home on Saturday when there is nobody at the aerodrome and it runs on a self-service basis what means, that you are landing or taking of on your discretion. The landing fee was 13,60 EUR and parking on the apron was free of charge. After securing the plane we left for Lalandia, which is only about 8 km away on the Baltic coast. In the afternoon I came back together with Torben who helped me to top the airplane with mogas. We had to go three times to the nearest gas station which was about 2,5 km away. The price of the unleaded 95 was only 1,19 EUR per liter what was as exactly 50% of the avgas price. As this blog is dedicated to flying I will not write much about this event here. What is really important to say is that this was again a unique event with excellent program and great speakers. Most of them are colleagues from the OakTable.net. I am really admiring Mogens and his wife Anette for excellent preparation of the event with the best social program. Mogens always jokes that the Lalandia events have 80/80 ratio - 80 percents of the time is conference program and 80 percents of the time is the social program - and this is possible only because we sleep so little. As my small contribution to the social part of the event I brought 15 liters of new wine "Teran" and warned everybody that he shouldn't spill it because he will not be able to remove the spot from the cloths. I had my presentation in the first slot on Thursday and after that I was able to attend other sessions. Thursday evening we had gala dinner and after the dinner at 22:00 we moved to the swimming pool until 01:30 where the rest of the social program was taking place. The last day we started at 9:15 and ended at 16:00 with the wrap-up session. On Saturday morning we left Lolland Falster/Maribo airport at 9:21 local time and headed towards Czech republic. The weather was excellent and we climbed to 8000 feet. In Northern Germany the weather was pretty nice, however, towards the south there was cloud layer with tops at 4000 feet. It was not a complete overcast so it would be possible to descend in case of emergency. The sky was clear of clouds near Czech border and also in Czech Republic. I planned to land at Letkov aerodrome near Plzen where they have mogas. It took us 3 hours and 16 minutes to LKPL and all the time we were flying at 8000 feet except the last 15 minutes when we descended to 4000 feet and later on to 3000 feet. After entering Czech Republic we switched to Karlovy Vary radar (LKKV) and later on to Praha info and finally to local frequency of Letkov. 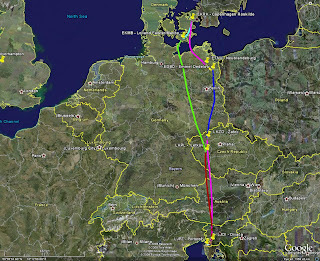 The route was: EKMB - MIC VOR - PAH NDB - LEG VOR- EDCJ - KONAR (Czech border) - LKPL. Letkov is a nice airfield used mostly by gliders but there are also many other airplanes. We topped the aircraft with mogas and checked the weather in Austrian Alps and Slovenia. I also phoned to Divača and found that a strong wind ("burja") is blowing at my home airport gusting to 35 knots. The route to Slovenia was: LKPL - DOMAL(Czech border) - RENKA(Austrian border) - VIW VOR - ISTRI (Slovenian border) - LJDI - LJPZ. also clear sky. After landing there we took a small late lunch and then contacted Divača by phone. In the mean time "burja" slowed down to about 15 KT what are for me "normal" conditions there. So we filed a flight plan and departed back to Divača, where we landed after 15 minutes. The wind was almost calm at the ground level, but we encountered pretty strong rotors in base and final. The most important thing I learned from this trip is that you loose your instruments in the most inappropriate moment. I could paraphrase the Murphy law as: "Murphy is standing out there and waiting for you!". Maybe even more important thing we found was that there are still many kind and helpful, hospitable people who are willing to help you in troubles. Thanks God for them! Oh, I really can't repeat here those stories because they included many so called "Russian methods" of maintenance, what means that they were using "brute force" method with a (sledge)-hammer and some other tool . Of course, this method was applied only after all other more gentle methods failed.